The Passive Aggressive Note: What Does it ACTUALLY Mean? Have you ever had a roommate that would leave you notes when you left dirty dishes in the sink, forgot to clean up your things off the kitchen table, or you had your friend over until 5 am? Have you ever been that roommate? If you’ve ever been in that situation (no matter what role you played), in most cases, in never ends well. This is because there is a lot more behind that note than you may initially think. The person doesn’t feel like they can talk to you. Maybe you give that aura of “Don’t mess with me,” or maybe they’ve just never experienced a problem with a roommate before and they don’t know what to do. The person could also just be afraid of confrontation, and this is their alternative to actually confronting you about the problem. You aren’t around for them to yell at, so they leave you a note instead. If someone is extremely frustrated, and you aren’t around, they may take out their frustration in note form. It’s not the best option, but it certainly happens. Sometimes it’s easy to see which option it is, especially when you know the person well, but then sometimes it isn’t. You need to think about what motivations they might have for writing a note like that and what might have you done to make them do that. You should go speak with your roommate about the note, because you don’t want to let things like this make the relationship worse. I say worse, because, let’s face it: your relationship is already not on the best of terms if you’re writing passive aggressive notes to one another. Think about what you’re going to say before you talk to them. Like we said in our previous posts about roommate relationships and conflict, it’s best to go into a situation prepared. You want to plan out what you want to say and how you will say it. Act calmly and rationally. Perhaps the worst thing you can do is to lash out and make accusations or make unrelated arguments about other things the person has done to frustrate you. Remember: You need to act instead of react. This means that you should act on the situation, i.e. talk with your roommate about your relationship, why they are leaving you notes, and what you can do to fix it. You don’t want to react to their note, meaning that you don’t want to go with your automatic and “gut” reaction to how that note made you feel. While both you and your roommates feelings are important and should be acknowledged, you don’t want to take out those feelings on your roommate. Perhaps the overall moral of the story is to be considerate and to have open communication between you and your roommate. It will be significantly more successful, and significantly more valuable, for you to talk with them instead of resorting to notes, because your reaction (or their reaction if you’re the offender) says it all. 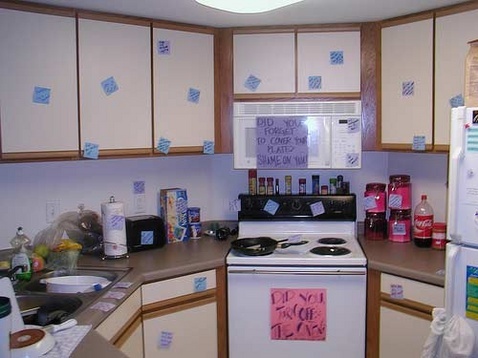 Don’t write passive aggressive notes to your roommates.